As the popularity of bubble shooter games continues to grow, developers keep coming up with new scenarios to extend the franchise. Bubble Shooter, which was recently updated by 3DGames, challenges players to rescue cuddly sheep that are trapped inside bubbles. The only way to release them is to shoot and match sets of similar bubbles. The game offers about 200 different levels and puzzles along with a variety of different maps and bubble styles. Players will encounter a fire bubble, a bomb bubble and other variations. Play modes are simple and easy to grasp for players of all ages. Just shoot three matching bubbles to advance. 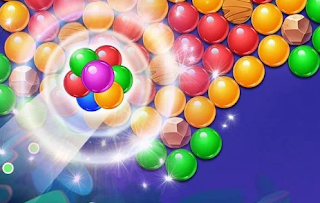 Bubble Shooter is available as a free download in the Google Play Store.